Fish 4 Dogs Salmon Mousse is a tasty, tempting complementary food for your dog, and is made with nothing but Salmon and natural seaweed extract, gently steamed before being whipped to a light and airy texture. Loaded with essential omega 3 fatty acids to help maintain and repair your canine's coat, skin and joints, Fish 4 Dogs Salmon Mousse is free from gluten, additives, preservatives and colourings. 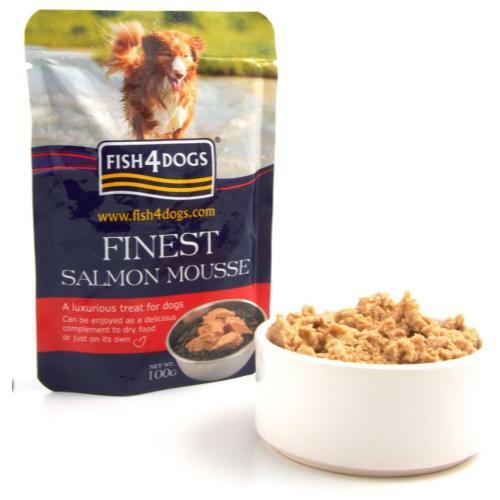 As a complementary food, Fish 4 Dogs Salmon Mousse is perfect as a treat, fed alongside a complete meal, or mixed in with a complete food to tempt fussy eaters.